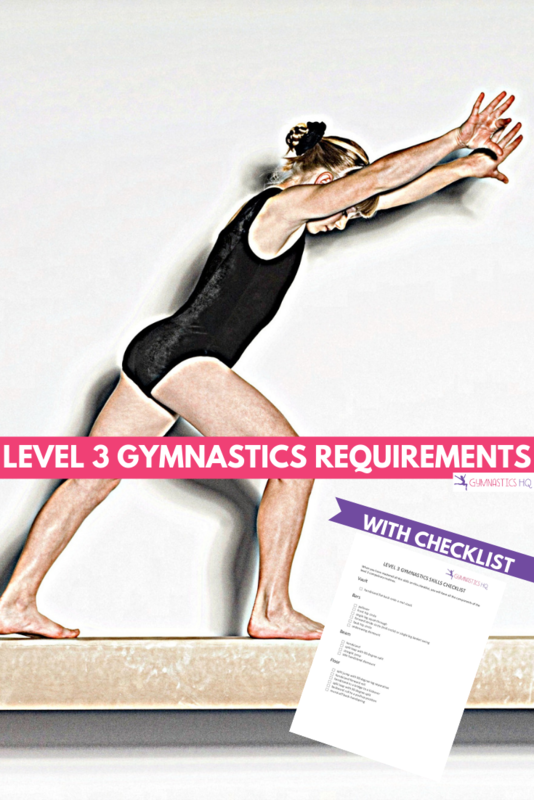 These are the level 3 gymnastics requirements. 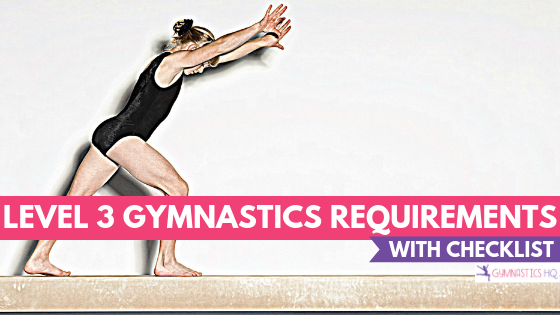 Level 3 in gymnastics is not a required competitive level; learn more about the gymnastics levels here. To compete in level 3 gymnastics a gymnast must be able to do the following skills on each of the four events and have reached her 6th birthday. I’ve starred the skills that are generally the hardest for gymnasts to learn and most often prohibit a gymnast from moving on to level 3. Once a gymnast can perform all of these skills and she has learned the Level 3 gymnastics compulsory routines, she is ready to compete in a Level 3 meet. The next gymnastics level is Level 4. My daughter is on Level 3 and can do all of these things already and we feel that she should be able to go on to the next level. They keep repeating easy things and we feel that she is being left behind and it’s hurting her skills. Rosanna, I’m sure that’s very frustrating. I think Christy has given you some great advice! I know that’s how I felt in level two. I would recommend talking to the coach or someone else at the gym. That’s what I did and I got moved up to level three and since then, the coaches in the gym have really payed attention to these things! Im a level 7 gymnast! I think that you should talk to your gym manager and get her moved up on her classes! If your gym is realy sincire about what their trying to do for your child, i suggest that if their is no room in the next class, have her stat to practice the skills that are in level 4 in the level 3 class that she is taking! I am in level three and I was good at doing the splits and I lost them and currently getting them back! I am a coach and I understand where your coming from. One important thing to remember is how high are her scores when she competes. You may feel she can do the skills but they may not be completely perfect looking. Some gyms keep their gymnasts in their current level until they achieve a certain score on each event or all-around. The best thing you can do is talk with your daughter's coach to A) let him/her know that your daughter is eager to advance and, B) discover if the gym/coach has specific criteria the gymnast must meet before moving up. Best of luck to you! I’m happy you are getting into a gym (if even just for safety!) I know you are going to love it!!!! Thanks for posting this! My daughter is 5 1/2 and has been in gymnastics for a year now. I just wanted to see whereabouts her skills lie, and she has a bit of work to do to get to competition level, which is fine. But, what is the typical age that a girl gets into competition at level 3? I would hate for her to be 8 years old competing with a bunch of 5 year olds. That just may have us concentrate more on a different sport, to be honest. For now, it’s fun, but as a former gymnast myself, I want to see her take it far! Thanks for your two cents. So the age of gymnasts at different levels really varies but honestly you are right that level 3 kids tend to be younger. However the minimum age to compete is at age 6, so there are no kids younger than that competing at level 3. Also that is not the only level gymnasts start competing at. Many gyms will start competing their slightly older gymnasts at either level 4 (minimum age 7) when they have learned those skills or they will compete them in the Xcel program. The Xcel program is a really great way for medium age to older kids to compete. It’s more flexible and in my opinion, more fun than compulsory gymnastics. So–I definitely would not be worried about her at age 5 or at age 8 being too old for the sport. In the Xcel program kids 5-15 have fun and compete with all the benefits of being involved in a sport. My daughter is 8years old and a level 3 gymnast. Most of her teammates will be 8yrs by competition time except two who are 7yrs. However, she also competed as a level one at 6years! Help that helps! I’m 13 years old and I just started gymnastics a year ago. I’m a fast learner, but I feel hopeless because I just started. I truly love and enjoy gymnastics but my parents arent willing to take me more than once a week. Also they don’t really care about gymnastics. Even if you aren’t able to do gymnastics at the gym more than once a week, you can still be practicing! Here are 10 Exercises you can do at home to improve your gymnastics skills! Good Luck! Hi! 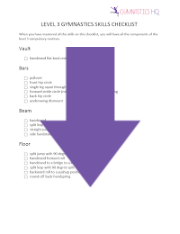 I am a level 3 gymnast and I MUST practice my floor routine but I do not know all of it yet, do you know of a website where I could get the full floor routine in words? Thanks! Hi Sophia, you would have to pay for the compulsory book to get the full routine in words. I would suggest looking on YouTube at videos of other gymnasts doing the routine! Hope that helps. Hi, I’m a 14 year old mostly self taught gymnast and I’ve been looking into which skill level I would fit into since I’m contemplating joining a gym again soon. From what I’ve seen so far I would fit best into level 3 or 4. Would that be mostly younger gymnasts at most given gyms? Would you have any suggestions for someone older like me with not as much practice in an actual gym to be able to train with people more my own age? I was a level 4 at about your age. I started late 11/12, as gymnasts go. Yes, most of my team/classmates were much younger than me, but it didn’t seem to matter to them. And honestly, it didn’t really matter to me once we were all working on skills. I was there first and foremost because I loved it. If you love the sport, the age of your classmates really doesn’t matter. You can have fun with the younger ones, like you would a younger sibling, but you can also connect with your teacher in a way younger gymnasts don’t/can’t. Never let age determine what you can’t/won’t do. Do what you love! I just need my 5 glide swing dismount and round off back handspring. To be able to get into level 3. Any advice? Hi it’s morgan I’m 10 and I was wondering what age would level 1 students be ???!?? Hi, I’m a 14 year old girl and me and my 13 year old friend really want to join gymnastics but we would be with like 6 year olds, any advice? I recently just got diagnosed with mono. How long do i have to wait to continue this level? You would want to ask a doctor! Hi, I am 11 years old and I am overweight at my gym, can I still compete also I started late last year and I am not as good as some of the other girls my age.Any advice? Hello, I have good advice for you. When I first started out I was overweight but my solution was to stop eating junk for about 3 months and eating salad instead. Now my weight is normal and I practice gymnastics 2 hrs a day. Same here, I started out late and I am 9 now. I am a self taught gymnast at the moment but will start soon. Hope you succeed and become a accelerated gymnast, good luck! I am 11 years old and I started gymnastics when I was 6 but I have been on and off this sport. When I go back I am afraid that when I go back I will be with 7 year old! It means the skills that are the harder ones to do. I have all the skills they list(round off back handspring is rusty) and my first meet is in 6 days. This will be my first meet EVER IN MY LIFE!!!! It’s just a fun meet so we’ll get spot if we want, but, we’re getting medals and this determins if we can move up to copettitive level 3 instead of non compettitive level 3. I’m so scared I will mess up and get a bad score even though everyone thinks I’ll get 1st on bars. I need help to not be so scared. I’m 11 years old ans started gymnastics 2 1/2 years ago and spent 4 months in level 2. I jus started gymnastics and I’m 12 years old. I want to join the team and I know I would be either a 2 or 3. Am I too old? I am a competitive majorette and dancer, and I am lacking in the gymnastics area of my sports. I have been considering joining a gymnastics class this fall but I am worried that I will feel too old in the class I would be put in ( I am 15). I have some experience dew to dance but I believe I would be somewhere around level 2. I live in a small town and my gym options are limited, the gym that I am leaning to only has classes that are 7+ or below that age. I would really appreciate any advice. I am a competitive majorette and dancer, and I am concodering joining a gymnastics class to improve my strength, stamina, and my gymnastics skills. I have limited gymnastics experience from dance, and I believe I would me around level 2. The problem is that I think I would feel really old in a class with other level 2 girls (I am 15). I live in a small town so my gym options are limited, the highest age group at the gym I am leaning towards is 7+, I really feel that taking a gymnastics class is what I need to do to grow as a majorette and dancer though. I would greatly appreciate any advice! I am in level 3and I can do everything except the round off back handspring. Can you help me . Hi, I started at 12 years old and I was put in a class with some girls who were younger than me by up to 4 years. Once I pasted out of that class, I went to a different gym and took a class that was two days a week with girls my age-15 years old who were much better than me. Luckily, the coach was good and supported me to get better and better. I practiced at home a lot. I did stretching and core, and a few handstands too, and now I am 13. I personally am a fast learner and have a natural aptitude for gymnastics. I started in the summer by doing cartwheels on the beach. If you want to get better and move up to competing, believe in yourself. I just had my first meet today. I now compete in the joga program. Joga is more relaxed and we meet two times a week and have four meets per season. Joga is gentler than USAG. From working on my form at home many people including the judges complimented me. People asked if I was previously a dancer and said I had beautiful form. On my team there are girls who range from 9-13, so I am one of the oldest, but other teams may have some older girls. I started at 12 years old and I was put in a class with some girls who were younger than me by up to 4 years. Once I pased out of that class, I went to a different gym and took a class that was two days a week with girls years old who were much better than me. Luckily, the coach was good and supported me to get better and better. I practiced at home a lot. I did stretching and core, and a few handstands too, and now I am 13. I am 11 and competing level three, I finally got my round off back handspring! This website has really helped me accomplish skills!! Yay Emma!! That’s great to hear!! My daughter is a level 3, she is 10 years old and she is still working on her front-hip circle. Her coach won’t let her compete until she is able to do this. The coach is allowing girls to compete that can’t even come close to doing the forward stride circle, which was a level 2 requirement, that my daughter is very good at. Is there any rule about that? I mean, in that it is a level 2 skill, it’s ok if they are missing that? I am starting to get very upset as the season is half over and my daughter is only competing in two events. (she is also still working on her back handspring). Any insight into the rules would be most appreciated. As long as the girls can compete the level 3 skills, they can do all the events in level 3. If you want, you could move your daughter to level 2. Any tips on getting my stride circle? Hi, I’m 11.I started teaching myself gymnastics when I was 7 and with the the help of my dad and my big sister I got better as I grew older. I started going for gymnastics in September last year. The problem is I live in a country where not many people even know what gymnastics is. I go to a gym run by a woman from Belgium. It’s really fun and I recently got my aerial. Another problem is they do only floor and I’ve been forever wanting to do beam and vault and bars. I’m starting to feel like I’ll never get to do them. And I don’t think its possible to do only floor .Also I’ve started getting a lot of mental blocks and I feel really discouraged when I see other people do back handsprings and back tucks.I feel like quitting gymnastics. Any advice? Hi! 13 year old level 3 gymnast starting this summer, can’t wait to become elite! I have always loved gymnastics but could never afford it. I started teaching myself this fall to prepare for this summer! I can do all of the skills on this list, but want to polish myself off because I’m just officially starting! I’m a 13-year-old who has recently gotten back into gymnastics and I would be level three. The gym I go to has lots of younger people in the classes, and I am a lot taller and bigger than them. Because of this, the classes are not very fun, and they are also at an easier level than I would like. Any advice? I am a 13-year-old that recently got back into gymnastics and would be a level 3. The class I am in is 3rd grade and up, but I will be moving into a higher-level class that is 1st grade and up. I am a tall person, and all the other people in my class are shorter, smaller, and younger than I am. It is kind of embarrassing, and it makes the class less fun. Any advice? I understand how you feel. I am not the oldest in my class but I have been feeling weird because the littles are much better than me in some parts. I started late. Just don’t think about it and keep going! Hi. I’ve been doing gymnastics since I was 4, and I love it with all my heart and have always tried my absolute hardest. I turn 14 in September, and I *just recently* got all the skills required for level three. I really really really want to compete, but I know I’m too old for it. Is there any solution to this problem, other then to work even harder and try to get the skills for my age group? Again, I’ve been working for 10 years and just barely got those skills. However, I was in a very small town with not very good gym resources, and I just moved to a much much much better town and gym. Do you think that will help? Thank you!! Hi Emilia, if you love the sport then that’s all that matters. You’re not too old to compete level 3. Your other option would be to look into the Xcel program where you can compete your own routines with skills that you can do. Good luck! I just started taking gymnastics classes a year and a half ago but I don’t compete yet. I want to join level three but I’m scared I’ll be made fun of because I’ll be decently older than the girls on the team, which are around nine. Should I just self teach until I can be on a team with girls more my age? Hi Lydia, it’s always best to learn from a trained coach at a gym. We’re sure you’ll pick up the skills fast and move up in levels so you can be with girls closer in age. Good luck! Hi i’m Keihu and i’m a self taught gymnast i have skills like back hand springs (on a trampoline) front handsprings front tucks (on the trampoline) bride kick overs, back walkovers, front walkovers, a Valdez (which i’m still working on a little bit) and much more i’m trying to persuade my mom to let me take classes and good news she agreed so i start next summer yay i’m so excited.But some times my mom get too over protective and doesn’t let me do it how do i convince her that i’m doing just fine. Hi Keihu, That’s great that she agreed to let you start next summer. I’m sure once she sees you doing the skills and having a great time then she’ll see that’s your doing fine! Good luck! Hi Jayna, You’d have to learn the dance moves from your coach since those are not things we can write down without a video or pictures to explain! Hope that helps! not exactly relevant to this but how exactly do you get onto a competitive team? are you invitied or do you schedule tryouts with a coach? ive been taking rec classes at my gym for two years now and i havent heard anything about girls being moved up to competition teams. how do i get onto one? Hi Sarah, You should definitely ask your coach to find out. Every gym does it differently but sometimes you have to let them know you’re interested and then they can go from there. Good luck! Whenever I try my back handspring I always get a block and can’t go backwards without painting halfway, bending my arms and… well failing.